Enjoy a guided walk along the South West Coast Path National Trail from Cape Cornwall, rounding the granite cliffs of Land’s End and finishing at Helford. This evocative journey was made throughout history by the fishermen, farmers, miners, smugglers, coastguards and patient soldiers watching for invasions which never came. 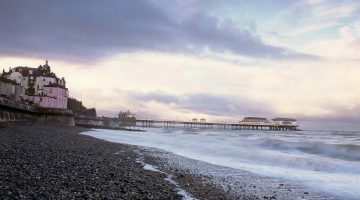 With wonderful vistas, magnificent beaches, secret coves and almost forgotten fishing villages, this fully guided trail walk includes some of the most enchanting sections of the South West Coast Path. This enchanting section of the South West Coastal Path explores a wide array of coastal landscapes, from the dramatic cliffs of Land’s End and the secluded coves of Mullion and Kynance, to the smaller fishing villages hugging the inlets and estuaries of Cornwall’s southern coastline. 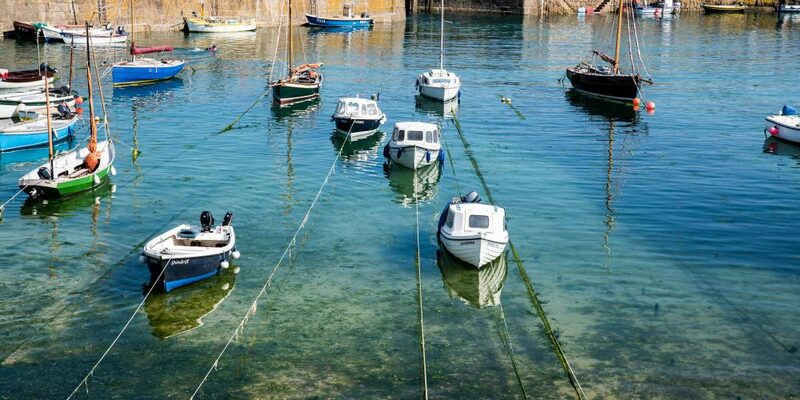 Admire breathtaking views of St Michael’s Mount and visit the pretty fishing village of Mousehole. 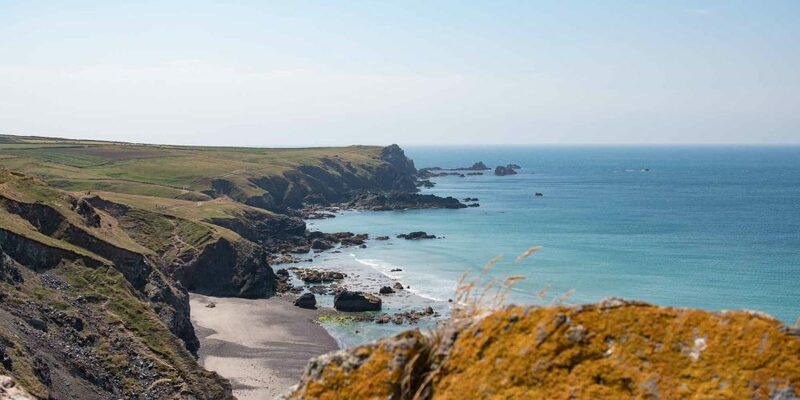 After the spectacular coastal scenery of Mount’s Bay, the coastline heads south on to the wild promontory of the Lizard Peninsula – the most southerly point on the British mainland. Experience the earthy appeal of traditional Cornish fishing villages like Cadgwith and Coverack before following the trail north to the Helford River whose steep slopes are densely wooded and rich in wildlife and whose literary connections lend an additional layer of romance and mystery to this rewarding walk. Every step of the journey has been carefully planned to help you make the most of your walking adventure. Click on the blue tabs below for more information. This group tour itinerary has been created by HF Holidays – one of the UK’s largest activity holiday companies – who specialise in guided walking holidays in the UK and Europe. Their experienced and knowledgeable volunteer leaders undergo a thorough assessment to lead you on your Guided Trail and will also be delighted to share their knowledge and enthusiasm with you. Your trail leader will carry all the necessary maps and guides. All walking days involve minibus or local transport between the walking route and your accommodation and this is included in your holiday price. Packed lunches are provided each day and after a sociable evening meal, you can join in an organised activity such as a quiz or a talk about the local area, relax in the bar or use the accommodation’s guest facilities. To find out more about this itinerary and make an enquiry or a booking, click on the Enquire Now button at the top of the page. The Save to My Rucksack button allows you to save itineraries to view later, or to download them as a PDF. 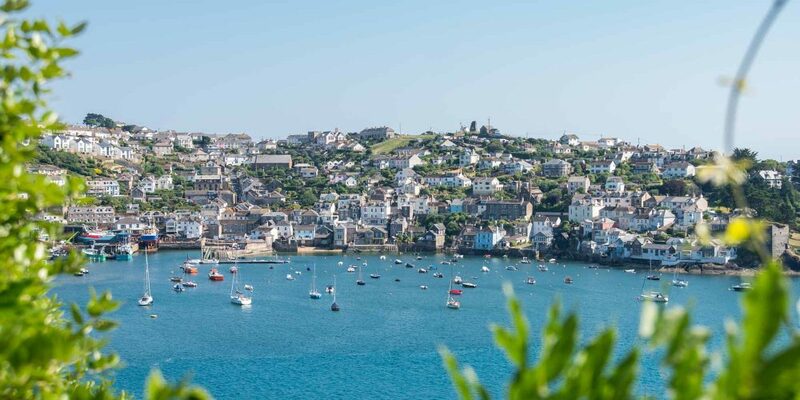 Starting on the windswept tip of Cornwall, this route heads south along the exposed clifftops to Land’s End, before heading east along the south coast, where a string of picturesque fishing villages and historic ports offer endless colour and interest. 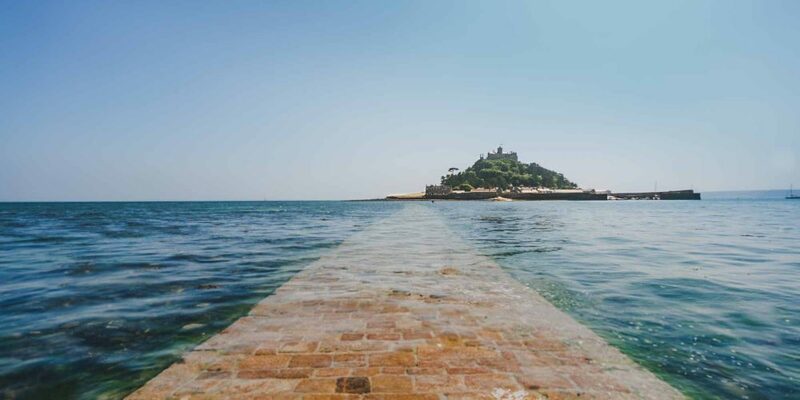 Admire the striking tidal island of St Michael’s Mount before heading south again along the wild coastline of the Lizard Peninsula, winding up in the romantic estuary port of Helford. Your walk leader will give an introductory talk about the holiday. Starting at Cape Cornwall, we walk past Carn Ballowall towards Porth Nanven and then along easy paths to Whitesand Bay and Sennen Cove, traversing the granite cliffs to Land’s End to continue over some of the most spectacular stretches of Britain’s coastline. The trail heads over Gwennap Head and down to Porthgwarra, a delightful cove with unusual tunnels through the cliffs and finally to the Minack Theatre – a unique open-air theatre created in the cliffs with the Atlantic as a backdrop. 18km / 11 miles with 2400ft (730m) of ascent. Leaving Porthcurno we drop down to Penberth Cove – preserved by the National Trust and completely unspoilt by commercialism. 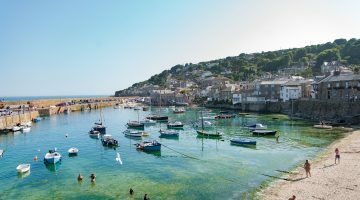 Further ascents and descents bring us to sheltered St Loy and its boulder-strewn beach before returning to rougher sections as we approach Lamorna Cove and continue, with stunning views of St Michael’s Mount, to Mousehole. 13km / 8 miles km with1860ft (570m) of ascent. Side-stepping the built-up areas around Penzance, the day starts at Marazion, where we walk along low sandstone cliffs towards Perranuthnoe, and then pass Cudden Point and Prussia Cove to reach the long sandy beach of Praa Sands. At Rinsey Head and Trewavas Head, we see partly restored mine buildings before continuing between fields and cliff paths to the fishing harbour of Porthleven. 16km / 10 miles with 1800ft (550m) of ascent. Returning to Porthleven harbour we follow the coast road to Loe Bar, the sand bank between Loe Pool, Cornwall’s largest freshwater lake, and the sea. We continue along the coast path to the fishing cove of Gunwalloe and then to Church Cove. The path continues to Poldhu Cove and the cliffs where the first radio signals were sent across the Atlantic by Marconi in 1901. A magnificent stretch of cliff scenery brings us to Mullion Cove and then to the scenic Kynance Cove. After rounding Lizard Head we reach Lizard Point, the most southerly point in England. 22.5km / 14 miles with 2510ft (765m) of ascent. From Lizard Green, we walk back towards Lizard Point and Polpeor Cove and past the Lizard Lighthouse. We continue towards a second Church Cove and past a collapsed cave known as the Devil’s Frying Pan to the pretty fishing village of Cadgwith. The path continues past the disused serpentine works at Poltesco across Kennack Sands, on to Black Head and down to Coverack village. 18 km / 11 miles with 2225ft (680m) of ascent. Starting at Coverack, a series of quarries – active and derelict – force the path away from the coast towards St Keverne. We rejoin the coast at Porthallow and continue to Nare Point with views of the wooded Helford River estuary. Continuing to Gillan Creek to the hamlet of St Anthony, the coastal path then goes towards Dennis Head before descending through the woods to Helford Village. 16.5km / 10.5 miles with 1640ft (500m) of ascent. After breakfast depart for return travel. Accommodation for this holiday is at HF Holidays’ country house Chy Morvah, meaning ‘house by the sea’ in Cornish, a characterful seaside property situated within walking distance of the centre of St Ives, which enjoys wonderful views along the north Cornwall coast. Chy Morvah has 39 bedrooms, either located in the main building or in the adjacent Lanyons House. The bedrooms all have their individual layout and character and you’ll find a TV with digital radio, hair dryer, towels and tea and coffee making facilities. On your departure day kindly vacate your bedroom by 10am. The public rooms at Chy Morvah make excellent use of its seaside location with the large lounge and dining room enjoying views to the sea, as does the garden and terrace. There’s also a licensed bar, open throughout your stay, and an outdoor swimming pool, open in summer. The boot and drying room is available to store your boots and to dry wet outdoor clothing. WiFi is accessible in all public areas. Regular International flights into Heathrow then train to St Ives. From Heathrow take the train to London Paddington station. From here there are direct trains to St Erth, and finally a short branch line train to St Ives. St Ives station is only ½ mile from Chy Morvah, but it is a steep uphill walk. We have negotiated a preferential rate with Ace Cars for all pre-booked journeys, of £3.50 per taxi. The 3½ mile journey from St Erth railway station takes approximately 20 minutes. The preferential rate for all pre-booked journeys with Ace Cars is £11.50 per taxi. They will arrange shared taxis wherever possible. To book a transfer please phone or email, giving at least 7 days’ notice. From the platform enter the station car park; on the left you will find a set of steps. Go up the steps to the main road. Turn left and after 30 metres take a right turn (before the Chy an Gerra Guest House) up a steep hill. At the top of this road turn left along Pendolva Terrace and then take the first right. Follow the hill upwards keeping The Longships Hotel on your left. Chy Morvah is in front of you. Parking is available in the grounds. No responsibility can be accepted for loss or damage to guests’ property or vehicles. This Guided Trail involves walking as a group on well-defined paths, though often in hilly or upland areas. These may be rough and steep in sections and will require a good level of fitness. We want you to be confident that you can meet the demands of each walking day and get the most out of your holiday. Please be sure you can manage the mileage and ascent detailed in the daily itineraries. It is important for your own enjoyment, and that of your fellow guests that you can maintain the pace. All holidays at our Country Houses are full board, from the evening meal on arrival to breakfast on the day of your departure. There’s a vegetarian option at all meals and we cater for gluten-free diets. The itinerary offers plenty of opportunities to sample traditional ales and local specialities in the towns and villages en route. 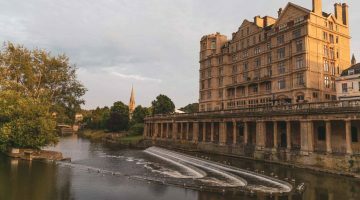 Spend a week discovering scenic and historic highlights of the Cotswold Way, including 2 nights in the city of Bath.